National emergency room (ER) utilization data tell us what hospitals and health plans see daily: that ER visits continue to rise and show few signs of slowing. According to the National Hospital Ambulatory Medical Care Survey (NHAMCS), there were 110.2 million ER visits in 2004, and more than 25 percent were for non-urgent or unknown causes. 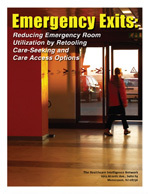 Frequent ER visitors — also referred to as “frequent flyers” — are often targets of ER redirection efforts. In reality, frequent flyers comprise a very small percentage of ER visitors. Two health plans have discovered that by analyzing patient care-seeking behaviors and reducing barriers to primary care access, they can successfully divert a measurable number of potential ER visitors to more appropriate care venues. In this 35-page special report, three physicians share the specifics of their health plans' ER diversion initiatives that have roots in patient self-care education, physician office adaptability and hospital-health plan partnerships. Their reframed approaches to emergency room utilization and primary care have netted them significant reductions in both ER visits and hospital admissions. After analyzing internal and NHAMCS data, WellPoint and Neighborhood Health Plan employed low touch, broad-based strategies built around patient education rather than expending energy on low numbers of frequent flyers whose behaviors are unlikely to change, or significantly affect an organization's financial health. This special report provides a blueprint for health plans, hospitals and providers desiring to address and reduce unnecessary ER utilization in their populations. It also contains a wealth of tactics from the more than 220 healthcare organizations that responded to HIN's e-survey on dealing with unnecessary ER visitors.